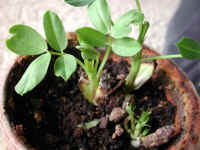 (Growing a Peanut from Seed - 01) One day when we were in a supermarket, we saw some raw peanuts for sale, and purchased a bag. 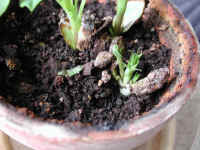 We had not seen peanuts growing, since we live in New York State, which is too far north to grow peanuts as a crop, so we decided to plant a few peanuts in a pot, and see what would happen. This is what grew a little over a week later. 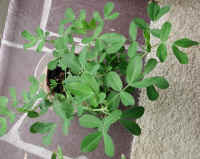 (Growing a Peanut from Seed - 02) This is another photo or our peanut plant. 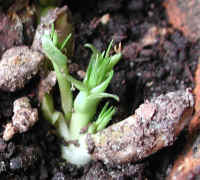 (Growing a Peanut from Seed - 03) In this photo we can see a new peanut plant starting to grow. Peanuts are not really nuts; they are members of the bean and pea family. (Growing a Peanut from Seed - 03a) This is a closer look at the peanut seedling. (Growing a Peanut from Seed - 04) This is another look at our peanut plant. 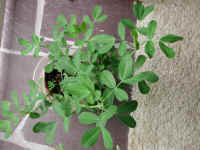 (Growing a Peanut from Seed - 05) We had the peanut plant growing in front of a sliding glass door, and the peanut plant got bigger and bigger every day. 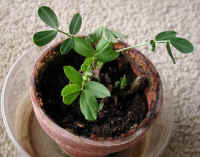 (Growing a Peanut from Seed - 06) This is another look at the potted peanut plant. 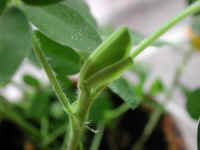 (Growing a Peanut from Seed - 07) Then one day we say what looked like a flower bud starting to open. 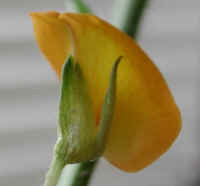 (Growing a Peanut from Seed - 08) So we looked a little closer, and saw that it really was a flower bud. 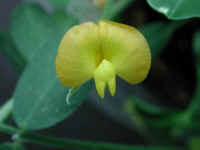 (Growing a Peanut from Seed - 09) This is a bee's eye view of the opening peanut flower. In this photo, we also have a good look at the hairs growing along the stems. 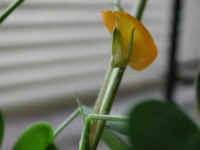 (Growing a Peanut from Seed - 10) And the next day we saw the first peanut flower. 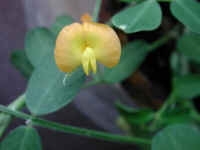 (Growing a Peanut from Seed - 11) This is another look at the peanut flower. 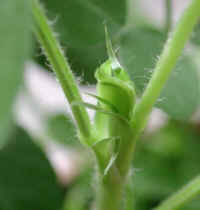 Unlike other beans and peas that have bean and pea pods form form the ovaries on the stem, the peanuts grow underground. 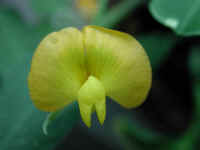 (Growing a Peanut from Seed - 11a) This is a bee's eye view of a beautiful peanut flower, which is typical in shape to other members of the pea family. 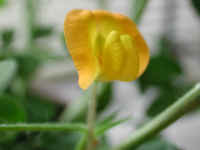 (Growing a Peanut from Seed - 12) This is a side view of a peanut flower and stem. 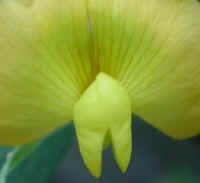 (Growing a Peanut from Seed - 12a) This is a close up side view of the peanut flower. As you have probably guessed, we have fun growing plants like this peanut, as we hope you will, too. 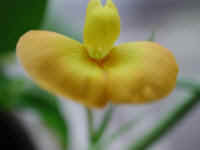 (Growing a Peanut from Seed - 13) This is another look at one of the flowers that are growing on our peanut plant. (Growing a Peanut from Seed - 13a) This is another bee's eye view of one of the peanut flowers. 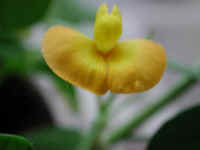 (Growing a Peanut from Seed - 14) This is another look at a peanut flower. 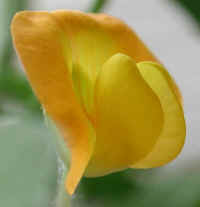 (Growing a Peanut from Seed - 14a) We are always amazed at the amount of detail that God puts into His creations, such as the sunburst design on the petals as well as the shape of the petals. 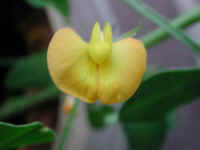 (Growing a Peanut from Seed - 15) This is another look at a peanut flower. 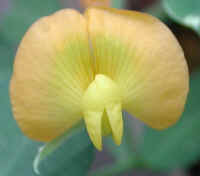 (Growing a Peanut from Seed - 16) This is another view of a peanut flower. 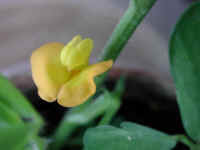 (Growing a Peanut from Seed - 17) This is another look at one of the peanut flowers. 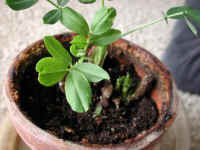 (Growing a Peanut from Seed - 18) This is another view of one of our pretty potted peanut flowers. 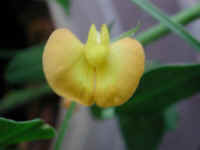 (Growing a Peanut from Seed - 19) This is another view of a peanut flower. 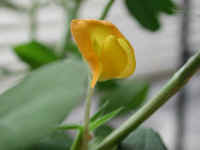 (Growing a Peanut from Seed - 20) This is a final look at one of the flowers on our potted peanut plant. 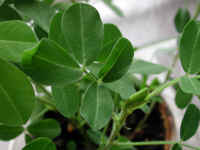 We hope you will also enjoy growing a peanut plant.